Last Monday we talked about how to navigate eating during the holidays. Of course we’re going to eat more than normal, because it’s the holidays and they happen once a year. Here are a few strategies that help: Be a dessert snob, tell yourself you can eat that later, and don’t arrive starving to the occasion! Read more about our full fledged strategy HERE. Find a workout buddy to help with accountability. When we have to meet someone at the gym for a suffer session we are are less likely to NOT show up. Schedule it into the family trip. Let your family know that you need an hour each day to get grounded in your body and take care of yourself. Communicating ahead of time helps set everyone up for success. 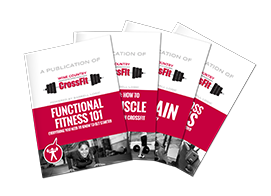 If there is not time to visit a local CrossFit gym then do one of our At-Home workouts found right HERE. Plan now for your 2019 athletic goals. If I have that 10K on the horizon, or a body building competition, or even a Tough Mudder in the New Year I am more apt to workout and control my eating to avoid the holiday bulge. Drink plenty of water. Staying hydrated helps to curb those cravings and makes you feel better all around. Prioritize sleep! We all feel best when we go to sleep at our normal hour, and get up as close to our usual waking hour. Planning is your key to success during the holiday season. Make a plan for what you will eat, what you will drink, and when you will sleep. Make a plan for when you will workout, and drink heaps of water. Best of luck to you in the exciting holiday season!